The people who have immigrated to the United States from war-stricken countries have risked EVERYTHING to come here and it’s not an easy process. For those of you who follow my blog know I’m a Christian and I’m passionate about doing anything we can to alleviate the circumstances Syrian, Iraqi, Afghan and other children are living in. I had to make a point so that my exact stance was understood. Please realize something…if I’m being frank the majority of us weren’t inhabitants of America so with that logic none of us belong here. People migrated to find new land, therefore, leaving their boundaries. That would mean our true boundaries are where our ancestors are from. This verse is about God being the all-knowing history maker and appointing times (years) and the places (not one place) where people will reside. As people, we are inhabitants of the whole earth and God is in control of our fate on this earth. The Bible tells us God is love and to be closer to God then you have to show love..towards enemies, neighbors, family, and friends. Looking at others as “lesser or bad” is not what we should be exemplifying as Christians. My God died for everyone and all of their sins, no matter who they were and where they came from. Our mission as Christians is to lead by example and challenge ourselves to be more like Him more and more every day. I read a book about an American girl who was Muslim, Rifqa Barry (Hiding in the Light). She grew up in a very traditional and devout Muslim household. Her friend kind-heartedly invited her to a church bible study she said, “yes.” God was calling her to a life of freedom and love. She hid her Christian faith from her family for 4 years and when they found out her father was told to end her life. She ran away and found refuge in a Christians’ family home where they showed her love and what this freeing religion has to offer. Instead of idolizing America, our sight should be set on the bigger picture and what we need to do as Christians to be able to walk into the kingdom of Heaven. I agree there need to be laws in place to prevent the “bad guys” from coming in but the way it’s being done and the way people are being treated because of their faith is not Christian. I don’t write this because I’m Republican. I don’t write this because I’m Democratic. I don’t write this because I’m a minority or a woman. 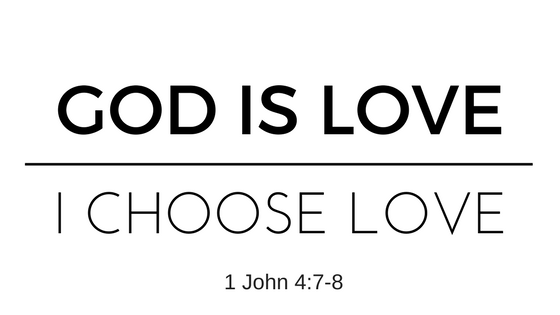 I write this because I’m a Christian and I choose to Love. Always. "5 Things 2016 Has Taught Me"